The head of Quebec's Federation of CEGEPs said Tuesday that the window to save the academic year is closing fast at junior colleges, where tens of thousands continue to boycott classes in the protest against looming university tuition fee hikes. "If I have to speak with you in two weeks, it will be too late," said Jean Beauchesne. "It will be cancelled for the semester." Beauchesne said CEGEPs have never lost an entire semester in their history. Universities are also under pressure to find a way to salvage the academic year. At Concordia University, where exams begin this week, university president Frederick Lowy staged a town hall meeting with striking students, who demanded to know why the administration has backed the government's decision to increase tuition fees by $1,625 over the next five years. "Overwhelmingly, we heard voices of students who have desperate amounts of debt, who are concerned about the future of education, who are not certain where the university's priorities lie," said Lex Gill, the president of Concordia's student union. Gill and many Concordia students blame administrative mismanagement for that university's financial woes — pointing to the $2.4 million spent on buy-out packages for four departing senior administrators over a 16-month period. "Two-point-four million goes a long way, and they handed it out to failing administrators," Gill charged. "So for the university to then go and cry, 'Oh, we're underfunded,' is a little bit rich, and students see through that." Montreal's French-language universities are preparing to extend their academic year into June, but Concordia has ruled against that. "For students who missed some of the course work that they would normally have completed during their last few weeks of class, there is some look at flexibility, accommodation," said Concordia spokesperson Chris Mota. "Can there be creative ways that faculty and students can work together to make sure they still complete this year successfully?" Earlier Tuesday, protesting students blocked traffic at the Port of Montreal, then moved on to other sites, including Quebec's education ministry offices. Students there said forfeiting the academic year is worth the fight, if the government backs down. "If I have to lose it, I'll lose it," said nursing student Lydia Ziana, who may have to give up a summer internship. "Whatever it takes, we're going to do it." 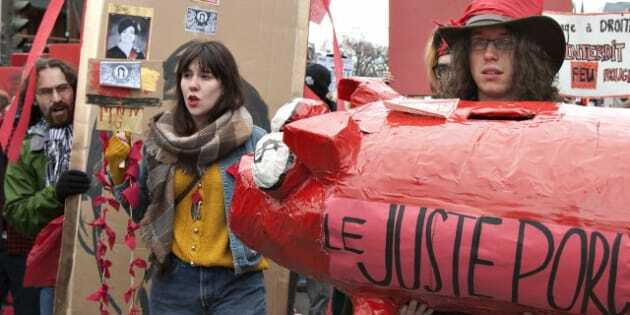 Meanwhile, a group calling itself the Movement of Socially Responsible Students said it is considering filing a class action suit against student groups, unions, and universities and CEGEPs that instructed teachers to respect the student picket lines. The group's founder, Simon Talbot, blamed what he calls "left wing extremists" for hijacking the system and blocking access to education for thousands like him.